All About The Bengal Breed: Everything you wanted to know about Bengals! By Cheddar and Dukey. They know Bengals because they are Bengals! The Bengal cat is a domestic breed developed to have the friendly, happy personality of a tabby cat, the intelligence of a Siamese and the exotic look of a wild jungle animal. 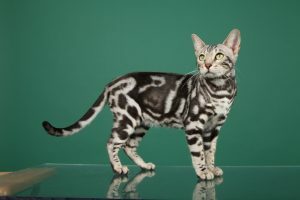 We were originally developed by Jean Mill, a California breeder, who was surprised when her Black and white housecat bred with a female Asian Leopard cat she had purchased at a pet store to keep him company. Imagine that. They produced a spotted kitten. Despite our distinctive spotted coat and way above average intelligence the Bengal cat is a fully domestic cat, meaning we love our humans and enjoying living the traditional life of a cat. STB cats are at least four generations from our wild ancestors and make wonderful pets, although we think of ourselves as owning you instead of the other way around. 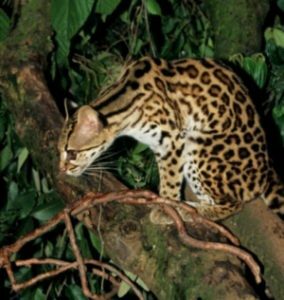 Typically Ocelots, Egyptian Maus, Abbyssians and even tabby cats are bred within our early lineage with the Asian Leopard cats for the goal of producing healthy, friendly, intelligent, and loving pets with a beautiful coat. asymmetrical (a different pattern on each side of the cat) pelt are considered highly desirable and make us look like our ancestors. TICA, The International Cat Association, was the first cat association to recognize the Bengal breed and give us the acknowledgment we deserve. In 1983 we were granted breed experimental status. Full recognition as an independent breed was awarded in 1991. Other organizations which also recognized the Bengal are the American Cat Fanciers Association, the United Feline Organization and the Canadian Cat Association. Want to learn more about our marvelous coats? Shapes that are two-toned are called “rosettes”. Rosettes have four major types – arrow, paw print, donut, and cloud – in addition to single spots. Some lucky cats have a connected row of donut rosettes running in a line on either side of the cat’s spine. This is referred to as “chaining” and is desired by the humans. 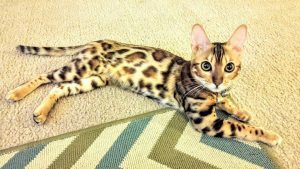 There are four basic “marble” Bengal patterns: horizontal flowing marble, reduced pattern horizontal flowing marble, Chaos pattern marble, Closed pattern or “sheet” marble, Bulls eye pattern, which is not desired by breeders but makes for a fun fur. Besides the Bengal pattern, glitter and ticking are often referred to when discussing the Bengal pelt. Glitter refers to translucent hair on the pelt that picks up the light and appears to make the cat sparkle. Ticking is when the hair shaft as an ombre or more than one color on each individual hair shaft. Cheddar has a lot of glitter even though it doesn’t show up well in her photos. Bengals are an average sized cat weighing 8 to 15 pounds. One of the most common questions asked of breeders is, “How big do we get?” Like most cats it depends on our parents with males averaging three pounds heavier than females. Check out our “Learn About The Bengals Behind The Blog” page to see how much we weigh. We have a long, lean athletic body with solid muscular frame. Unless overfed, most Bengals will retain our toned physique throughout our life. The curious and rambunctious Bengal is decidedly active and highly intelligent. Fun to live with, we are not the type to hide under the couch when guests arrive. Bengals are confident, usually talkative, friendly cats who like human interaction. Always alert, we are aware of our surroundings and anything new in the house. We are experts at playing games, such as fetch, and will delight you with our humorous and often acrobatic antics. You need to have plenty of toys on hand because a bored Bengal can be a bad Bengal. At least that’s what our humans say. We Bengals often learn how to flush toilets repeatedly just to watch the water drain, open doors, turn light switches on and off, knock items off bookshelves to watch them fall, take apart electronics just to see how they work. Once I, Dukey, took apart the printer to see why it spit paper out at me. Now we have a new printer. Often referred to as the Australian Shepherd of the feline world, we Bengals love to hunt and herd. Be prepared to play with your Bengal a couple of times a day and to switch out toys to avoid boredom. Contrary to popular belief not all Bengals love playing in water, but many do. Cheddar avoids the Water but I, Dukey, love it. Often I will jump into a full bathtub or join the humans in the shower. Running water is typically fascinating and more than one lucky Bengal owner has a kiddie pool in the yard for their cat. 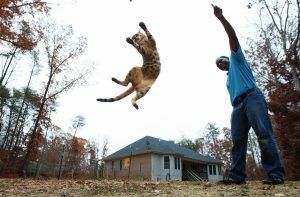 Since our for-bearers, the Asian Leopard Cat loves to climb trees, we Bengals have inherited our love of heights from our ancestors. Bengals can often be found perching at the highest point we can reach in the home whether that is the top of a door, a cabinet, or a cat tree. We Bengals love our families. We get along with dogs, as well as other pets and enjoy interacting with children of all ages. As a breed, Bengals are healthy and are subject to the same diseases as the general cat population with one exception. Hypertrophic cardiomyopathy, a form of heart disease can be genetic passed down. A reputable breeder will test for this and furnish you with a negative test result when you take your new cat home. The short pelt of the Bengal is easily cared for with no maintenance required from you. We keep our coats fastidiously groomed. Although If you insist on brushing our pelt we don’t mind. 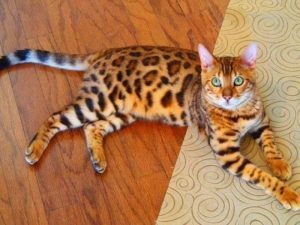 Since the Bengal has the fast growing claws of the Asian Leopard Cat, we could use a good nail trimming every couple of weeks. If there is build up around our eyes, you can wipe with a soft, damp cloth to remove any discharge. To avoid spreading infection, use a different side of the cloth for each eye. If the Bengal’s ears look dirty, you can wipe them with a half and half mixture of cider vinegar and warm water on a cotton ball or cloth. Do not ever use Q-tips on our ears as you might accidentally puncture our eardrum. Bengals like a clean litter box and we will tell you about it if we think it is not getting cleaned enough. An unclean box can lead to us marking in the house. Scoop the box daily like a good human and we won’t have any issues. While Bengals love the great outdoors, and will try to escape any chance we get, keeping your cat inside will protect us from diseases, being run over by a car, and being stolen. I never want to be taken from the humans I love. Since the Bengal has inherited a pelt, like a rabbit, from our ancestors we shed much less than a typical domestic feline. 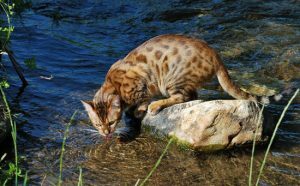 While we are not hypoallergenic, many people report that due to the Bengal having a pelt instead of fur, they do not have the same allergic reaction that they would to living with a typical cat. and there is nothing typical about us at all!